Ayurveda recommends brushing your teeth regularly for good health. During ancient times, Indians used the twigs of specific plants and trees as toothbrushes, and the tradition is still followed in many places. 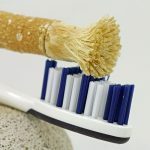 If you compare the oral hygiene of people using ancient brushing methods to that of people using toothpaste and toothbrush, you will notice a vast difference. The incidence of dental caries is usually lesser in people who use twigs to clean their teeth. But what’s so special about this ancient method of brushing your teeth? Let’s find out! The most common way to clean teeth in ancient times was to use the twigs of trees. They required no special toothpaste as the twigs themselves contained medicinal properties required to clean the teeth and keep them healthy. Chewing the edges of the twigs formed the bristles, which were sufficient enough to clean the teeth and reach every corner at the same time. 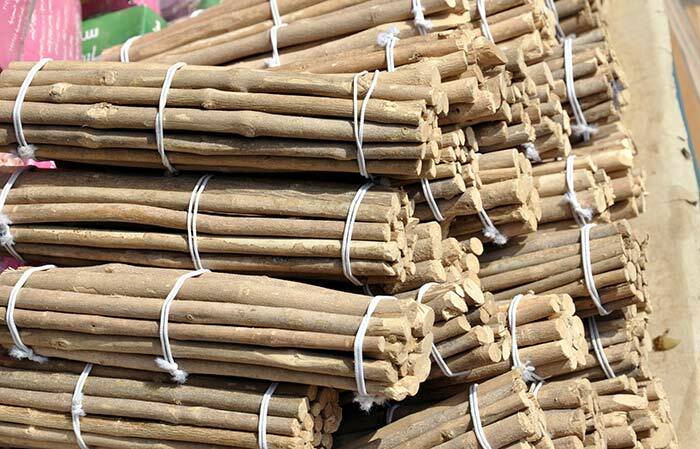 Chewing these twigs also prevented the formation of dental plaque. You should select twigs from plants that have a bitter, pungent, or astringent taste. The bitter-tasting herbs possess antimicrobial properties, which help in maintaining the oral hygiene. They also help in fighting bad breath and anorexia and awakening the taste buds. An example of a bitter-tasting herb is neem. Herbs with a pungent taste help in improving salivation and flushing out toxins from the mouth. One such pungent herb is karanja. Herbs with an astringent taste help in healing wounds or ulcers on gums and fight bad breath. An example of an astringent herb is khadira i.e. Acacia catechu. Some plants that you can select to make your own toothbrush are karanja, neem, akra, khadira, kakubha, meswak, Bengal fig, and licorice. 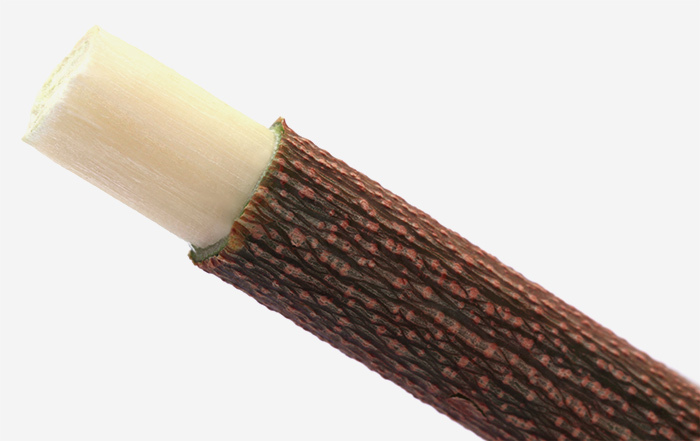 The length of the twig must be around 25 cm, and the thickness should be approximately equal to the thickness of your fingers. To use this twig as a brush, chew the twig a bit from the front. Use gentle strokes. How Effective Are Herbal Toothpastes? 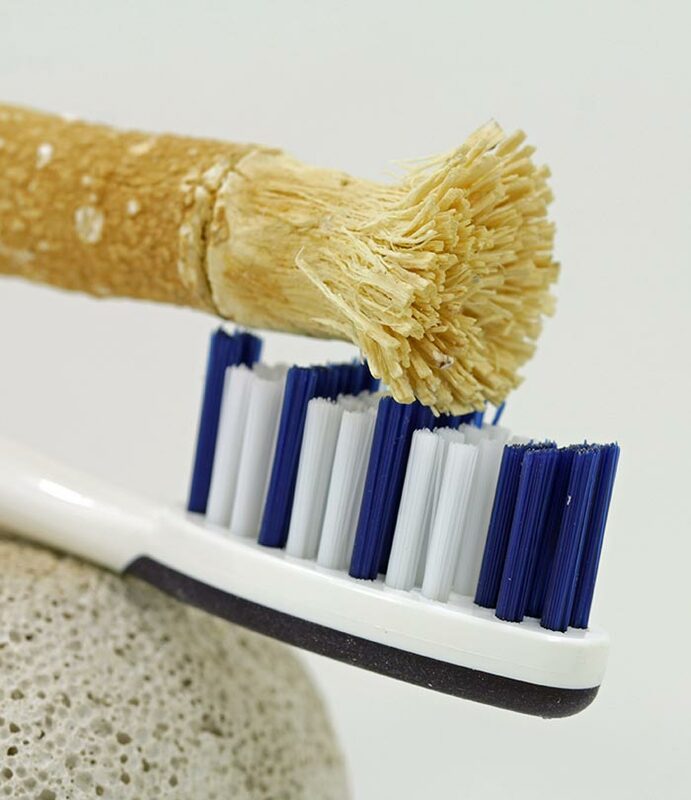 Many herbal toothpastes are available in the market that promise the same benefits as those of twigs. These toothpastes are better than the other chemically-loaded ones. They help to get rid of bad odor, but the effects are temporary as compared to those of twigs. Brush your teeth properly for at least two minutes. Use short and gentle strokes. Clean the gaps in between your teeth properly. While brushing the outer surface, you should keep your brush at an angle of 45 degrees. Do not make linear strokes. Instead, use circular strokes. Pay special attention to the back teeth, gums, and the areas of restoration. Ayurveda strongly recommends scraping the tongue right after brushing your teeth. This daily practice helps in maintaining the oral health along with physical, mental, and spiritual health. 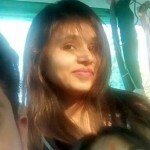 It is also mentioned in the Charaka Samhita that tongue scraping i.e. jihwa prakshalana removes foul smell and tastelessness by removing the coating of dirt or build-up from the tongue. It makes your mouth feel fresh. Scraping stimulates the reflex points on the tongue and enables the secretion of digestive enzymes. You must select tongue scrapers that do not have sharp edges. Ayurveda recommends using scrapers made of metals such as gold, silver, tin, copper, and brass. Ayurveda also recommends using specific metal scrapers based on your body type to gain more benefits. If your body type is pitta, then you must use a silver tongue scraper. If your body type is vata, then you must use a golden tongue scraper. If your body type is kapha, then you must use a copper tongue scraper. You can now take care of your oral hygiene and brighten your teeth in an Ayurvedic way! We hope you liked the article. Share your views in the comments box below.